Last week, my boyfriend and I traveled to Washington, D.C. from Atlanta, GA, for business. Unfortunately we were both sick and unable to do much by way of sightseeing. HOWEVER, I had never been to Arlington National Cemetery, Arlington, VA. It was LITERALLY in the backyard of our hotel, the Sheraton. Needless to say, we both mustered up enough strength to make the extremely short drive over there. 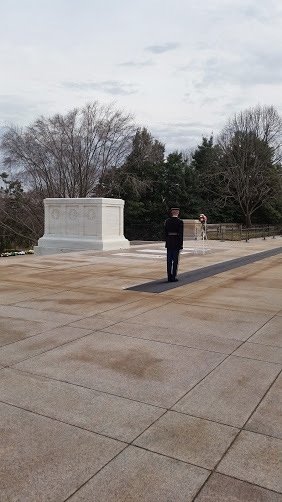 One of the first places I wanted to see, which ended up being the last, due to our wanting to see the “changing of the guards”, was the Tomb of the Unknown Soldier. What an amazing and honored experience! I was there last week also, on Friday. The weather was so awful we did not see nearly as much as we wanted to but we did get in the National Mall. So many great sites in DC — I would love to do it again in the summer. You SHOULD! It was a very humbling experience! Where are your travels taking you now? Thanks for that suggestion! Just checked out the menu, the jazz brunch looks awesome. We also have reservations for Commanders Palace and are looking to check out Acme and a bunch of other places, so you know we’ll be full after this trip!